The walled Adriatic city of Dubrovnik is now a chic shopping and dining destination, made more popular by its “Game of Thrones” association. Yet the cooler heads of politics in Washington say it’s entirely possible. Dems would have to run the table — winning all 10 Democratic incumbent re-election contests in states that went for President Trump in 2016. And also they would have to pick off at least two seats from Republicans. A few months ago, that seemed a tall order. Now? Not a slam dunk, but inside the realm of reasonable. “I hope when the smoke clears, we’ll still have a majority,” a downbeat Senate Majority Leader Mitch McConnell, R-Ky., said Tuesday, according to the Washington Post. If it happens, the reason why will hardly be a mystery. President Donald Trump’s approval rating is low and going lower, while Democratic-voter motivation is gaining altitude. Connecticut’s Senate contest between Sen. Chris Murphy and GOP challenger Matthew Corey isn’t exactly a bellwether. But the prospect of Democratic retaking of the Senate does beg the question of what’s in it for Murphy, Sen. Richard Blumenthal, and bluish Connecticut? Whether Republican or Democrat, the move up to chairman often is a game of musical chairs. It all depends not only on how senior the senator is, but the choices those ahead in the pecking order make. Kind of like being a kid in the candy aisle — if you chose Snickers, its unlikely Mom will also let you have Milky Way. Murphy, Connecticut’s junior senator and a longshot 2020 presidential contender, would love to be chairman of the Senate Foreign Relations Committee or, heck, Senate Appropriations. He’s a relatively junior member, so ascension to No. 1 is not likely in the cards. But he could become chairman of the Foreign Relations subcommittee with jurisdiction over Europe and “regional security cooperation” — a good perch for robust resistance to Russia and Vladimir Putin. In the GOP senate, he is the subcommittee’s senior Democrat. If Murphy wins musical chairs for the Appropriations military construction subcommittee chairmanship, expect the spigots to open for Electric Boat, Pratt & Whitney, Sikorsky and the multitude of military subcontractors in Connecticut. It’s hard to imagine the gush being any greater than it is now under pro-military Trump. But you never know. For Blumenthal, the state’s former attorney general and U.S. attorney, chairmanship of the Senate Judiciary Committee likely would be the dream job. But much like Murphy, Blumenthal has a long line of Democrats ahead of him and would have to be exceedingly fortunate in musical chairs to win any committee leadership post. A more likely scenario for Blumenthal is chairmanship of the Senate Commerce, Science and Transportation subcommittee on consumer protection and product safety. Blumenthal’s interest in these subjects borders on obsession, dating back to his 20 years as Connecticut attorney general. Whether it’s Takata air bags, faulty GM ignition switches or cracked and crumbling Connecticut home foundations laced with pyrrhotite, Blumenthal is out front in finger-pointing and legislative remedying. And, no surprise, he currently is the top Democrat on the Republican-led subcommittee. One footnote from the summer: Given what’s been going on in Washington these days, you wouldn’t think Rep. Jim Himes would be all that interested in a fantasy-land vacation. But since he doubles as Good Dad to teenage daughters Emma and Linley, he authorized and appropriated a family vacation in Dubrovnik on the coast of Croatia. 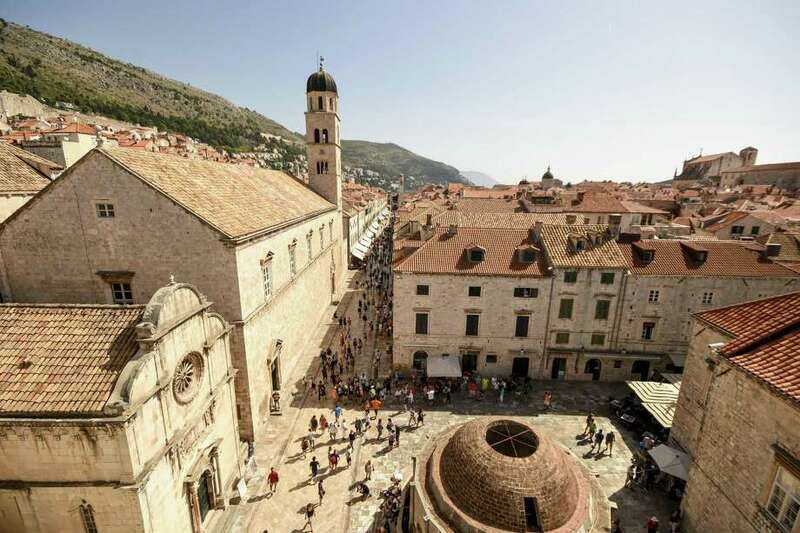 Readers who are fans of “Game of Thrones” will recognize Dubrovnik as the backdrop for the mythic “King’s Landing.” The historic walled-in port city evidently didn’t need much dolling up in order to double as the fortified stronghold of the Lannister family. “For those who have seen the series and are passionate about it, a visit to Dubrovnik will become a beautiful déjà vu because of the way in which it was so well integrated into the setting of the series,” was the description on the website kingslandingdubrovnik.com. “It was a big hit with the Himes teens,” said Dad, noting his daughters’ over-the-top GOT fandom. But the trip was not all pleasure and no business. Himes, a House Intel member, split off for a congressional trip to the “NATO Cooperative Cyber Defence Centre of Excellence” in Estonia, which sits astride Russia.